As a toast to the sizzling summer, a couple of friends and I decided to throw an event that was sure to be a crowd pleaser: an oyster and champagne tasting party. The affair was a huge success! Everything went off smoothly and I came away with a handful of valuable tips and to-do's that could help improve future oyster parties. What's not to love about oysters and champagne? Beyond having an excuse to throw a rockin' summer soiree for ourselves, this event gave each of us the opportunity to contribute our own unique strengths. My friend Chavelli designed a charming collection of invitations, tasting cards, and oyster identification cards (copy courtesy of Element Seafood). 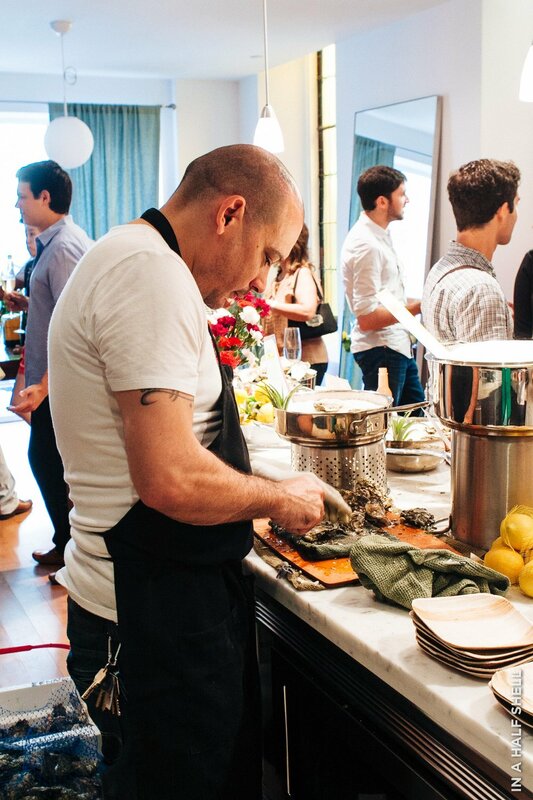 Matt curated the champagnes and graciously hosted the party at his uber-posh West Village pad. I naturally organized the oyster front: sourcing, shucking (big thanks to Eddie Oyster), and educating the masses. In our case, collaboration worked out well. If you're planning your party with friends, make sure that everyone knows their roles and responsibilities up front. It also wouldn't hurt to have a main "party lead"—someone who is buttoned up and motivated to manage the entire effort. For us, we were actually imagining a pretty instructional tasting affair—everyone would try each oyster with each champagne. Based on this, we decided to supply guests with tasting guides (instructions on the front, a tasting grid on the back). Of course it didn't happen the way that we imagined, due partially to the set up. A sit down, as opposed to a free-standing affair, would have been more conducive to a methodical tasting. However, the mood that we aimed for was spot on so the right thing was achieved! Is it an intimate gathering with close friends? Or a "mixer" among like-minded acquaintances? Since the three of us have pretty different circles of friends, it naturally became an event where new interactions took place. Due to building's noise-level restrictions, we also decided to keep it between 30-40 guests total. It was an interesting challenge to select which guests to invite... knowing that they all needed to mesh well. How much information should your guests have? I personally wanted the party leave everyone with a little more knowledge about oysters than when they first came in. Different levels of familiarity or interest for oysters were also taken into consideration during the development of the invitation copy and tasting guide. Be warned... an oyster & champagne isn't cheap. You're dealing with two relatively high-end products. What you can control is how much you'd like your guests to pitch in. We decided to require all attendees to bring a chilled bottle of champagne (one of the four on the tasting menu) to counterbalance some of the costs. More on costs below! Once the structure, vibe, and content of the party is settled on, then it's time to think about the physical requirements needed to make it all happen. There are a few areas to focus on: space, oysters, champagne, and other items to help "party flow." Here's a basic breakdown of things to consider for each of these important aspects. It's easiest to start with a venue and try to develop a party that fits the space. 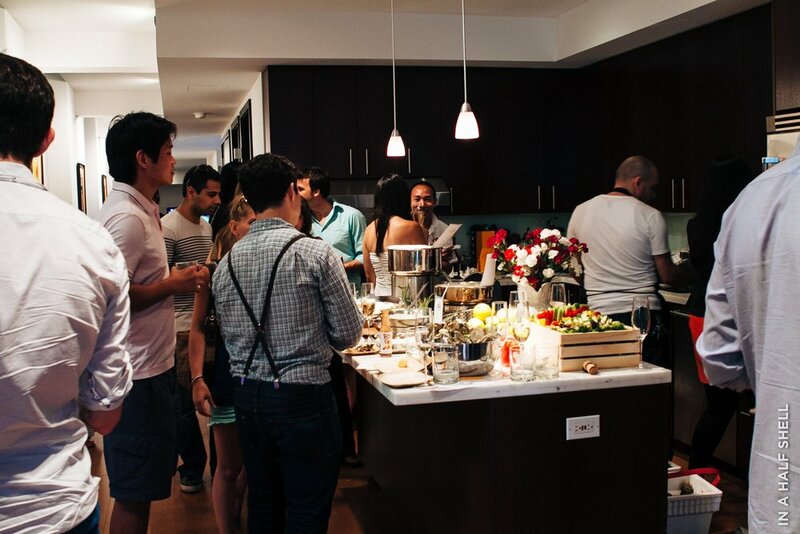 If you have the flexibility to host the event in someone else's space, make sure to discuss logistics early on. We were fortunate enough to have Element Seafood supply our oysters, as their products are the bomb. **Update: Element Seafood now has an online oyster shop, but you still have to pick them up from Williamsburg. ** They offer a good range of West Coast oysters. Quantity: estimate about six oysters per person, but 12 oysters per person if you know that EVERYONE in the room is an oyster lover. Variety: start with at least one variety from the East Coast and one from the West coast. It's even better to have two from each coast: e.g., British Columbia, Washington, Rhode Island, and Massachusetts), but most importantly, ask about what's good. The best oysters will vary from week to week. Shucking: I cannot stress the importance of this person. Hiring a professional shucker will make a huge huge huge difference. It will vary in cost from $50/hr to $1/piece; have the shucker arrive one to half-an-hour prior to the party to set up and start shucking. Accoutrements to supply: we had lemons, limes (makes for good decor too), mignonette sauce, and hot sauce; we also brought out some creme fraiche and caviar for extra indulgence! While the party's focus is on oysters and bubbles, there should definitely be other nibbles and beverages offered. Lastly, don't underestimate the importance/need of conducting a quick and swift clean up too. Oyster shells, no matter how fresh, will start to smell a bit funky after being out for too long. These ballparks will naturally vary depending on the scale and scope of the party. For estimating purposes, I would be as conservative as possible. With a reasonable level of confidence, I estimate that given a $900 budget, you should be able to throw a decent (while straightforward) shindig for 20 people. To help keep costs down, ask friends to bring chilled champagne bottles to contribute to the party. Similar to tasting wine, first smell the champagne's aroma. Then take a small sip and observe its flavors. Use a small fork or your finger to gently release the oyster from its shell to ensure smooth slurpage. Raise the oyster shell to your lips, tilt back, sip the liquor and let the oyster slide into your mouth. Chew the oyster for the full flavor and texture experience. The longer you chew, the more sweetness and flavors you'll discover. Before or after swallowing the oyster, take another small sip of champagne. Swirl the bubbles around in your mouth and observe how the flavors work with each other. Repeat using the same champagne with another type of oyster. Well, I hope that you enjoyed reading this post and now are inspired to throw your own oyster & champagne party! If you have other ideas or tips on how to make such a party an even bigger success, please share them in the comments section! Also feel free to ask any questions that you might have.